One of America's finest guitarists, Muriel Anderson returns to Santa Cruz for an intimate evening concert at the landmark Darling House. Muriel will be playing one of Kenny Hill's Signature model guitars. Limited seating. $18 advance, $20 at door. Students and seniors $15. House concert sponsored by Kenny Hill Guitar Company, The Darling House and Waterbird Entertainment. Thursday June 25 at 7:30 - 9:30 pm. Muriel Anderson's music encompasses many genres on both guitar and harp guitar. She was the first woman to win the National Fingerpicking Guitar Championship and was also awarded a bronze level for classical in the 2009 Acoustic Guitar Magazine's Players Choice poll. Her audiences are delighted with a range of music from international, folk, classical, jazz, pop, and bluegrass. She has been composing since the age of six and has published works for guitar and orchestra, voice, and solo guitar. Muriel has published several instructional books and videos and tours extensively. She is also the founder and director of Music for Life Alliance charity, and is the host of Muriel Anderson’s All STAR GUITAR NIGHT. 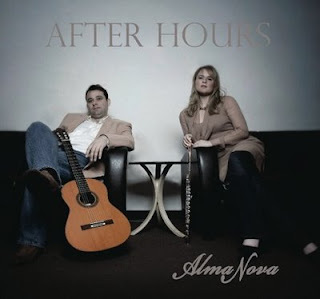 Our talented friends Almer Imamovic and Jessica Pierce have released a new CD. Almer plays his Signature in this excellent recording. It's another opportunity to get a sense of how the Signature sounds in the hands of this gifted artist. You can hear samples and there's a link to purchase the album at their website: here. This latest project pays tribute to some of the most beautiful and haunting melodies from Macedonia. We also have included some exciting new original works that reflect this part of the world. AlmaNova is a talented, classically trained flute and guitar duo presenting an eclectic program of music from all over the world. Each of these diverse musicians has been trained in the classical tradition while exploring other types of music. This great love of all musical genres shines through to their audience by way of dynamic performances and mesmerizing stage presence. AlmaNova has traveled all over the world playing their unique blend of music from the Balkans, Spain, Latin America, and the British Isles. AlmaNova performs exclusively with Kenny Hill guitars and Sankyo flutes.